The FPU2000 series has been discontinued. Please see the FPU2000A Series as a possible alternative or contact our Flow Engineering department. 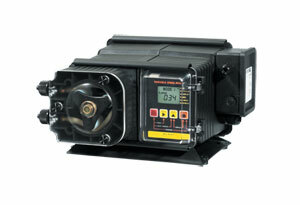 The FPU2000 Series fixed pumps feed by an analog fixed 60 second timer. The pump can be on for 1 to 60 seconds. All FPU2000 Series have fixed speed outputs and can be adjusted by selecting the pumphead tube size and choosing the desired RPM (revolutions per minute). The FPUVS2000 and FPUDVS2000 Series variable speed pumps are for continuous pumping relatively pulse free, even while adjusting the percentage of output. The variable speed pump requires the use of brushes on the DC motor. Excellent brush life expectancy (2000 hours). An extra set of brushes included with every pump. The FPUDVS2000 Series will accept any one of three different types of external input signals; 4 to 20 mA, 0 to 10 Vdc, or frequency. The 4 to 20 mA and 0 to 10 Vdc loops must be powered. Two types of frequency inputs, AC sine waves (magnetic coils type outputs) and digital square waves (Hall Effect signals, contact closures), are acceptable. A jumper plug located on the circuit board is factory pre-set for AC sine wave signals, the jumper must be re-positioned when digital square wave signals are being used. All wiring connections are to be made inside of the junction box located on the side of the FPUDVS2000 Series. A liquid tight connector is supplied and should be used for the external signal cable. The signal input wires are color coded to the type of signal being used. 참고: Comes complete with suction tube strainer, tube weight, suction tubing, discharge tubing and injection fitting with internal back-flow check valve, mounting hardware, and operator’s manual. FPUVS and FPUDVS come with an additional set of brushes. For optional CE approved 220 Vac/50Hz add suffix "-220/50" to model number, no additional charge. For optional CE approved 230 Vac/60 Hz model add suffix "-230/60" to model number, no additional charge. Note: 220 Vac/50Hz fixed speed models output approximately 20% less.